I'm not fond of the door-to-door sales people. Whether it's magazines, new siding for the house, or Ft Myers custom doors, I try to say no, but it's usually really hard for me, especially face to face. When I see them canvassing the neighborhood, I keep everyone away from the windows and turn the volume down (on the music, TV and/or kids). We hide (sort of) and just wait for them to go away. Seriously, if my Husband is home, I make him answer the door. He's good at saying no. I keep getting phone calls from Jenny's Steam Cleaners. Caller ID says "Atlanta" and Thankfully it's an automated call, I have no problem hanging up the phone. I was pretty proud of myself for spotting one of these phone solicitors last night. The woman was very pleasant and asked if she could ask me a couple questions. "Sure", I said. "How old is your home?" was her first question. I was skeptical of her motive, but knew she was trying to sell me something. "Are the original windows still in the house?" BINGO, she's selling replacement windows. I answered (lying) "Oh no, we replaced them all two years ago." "Oh, okay" she said. "So if you were planning on doing any home improvements in the next two years, what would it be?" I've had enough of these sales people roll up at my door so I'm pretty familiar with the fact that a lot of them also do siding and sun rooms, I quickly responded "Oh, I would LOVE to replace all the flooring in my house." She smiled, you really can hear that through the phone, and said "Thank You for your time" and hung up. What tricks to you use to get rid of solicitors? Being the "under $5" enthusiast that I am, I was pleasantly surprised to find a 50% off rack at the local grocery store. Actually Hubster found it, but he immediately called to inform me of the choices. I picked out 3 bottles and he brought them home. My first selection was this Smoking Loon Old Vine Zinfandel (2006). Regularly priced at around $9, we paid $4.74. Coloring: Deep and rich. When held up to light it only slightly penetrated the garnet swirling in my glass. Aroma: was that of a wood shed filled with pepper and raspberries. Flavor: The first taste was similar to the aroma with an earthy finish and left my mouth tingling in anticipation of more. Half-way through the glass I was tasting more spice and berries and truly enjoyed this wine. Vision: I can picture myself enjoying this at one of our friends Outer Banks rentals . Sitting on the deck with friends and family, enjoying a glass before dinner. This Zinfandel pours a slightly translucent garnet in the glass, with an enticing aroma of spice and mixed berry. Raspberry, clove, and white pepper draw you in, and the interplay between fruit and spice changes and evolves on the palate, a tell-tale quality of a fine wine. Spiced blackberry cobbler and rich caramel come through nicely on the initial taste. The dried fruit character on the mid-palate reveals its old vine terroir, especially as the wine transitions to its gamey, sweet, and lightly tart finish, leaving a hint of black raspberry in its wake. With the wide breadth of flavors that this wine brings to the table, this sophisticated Zinfandel should please both the occasional wine drinker and the connoisseur alike. For the money we paid as well as the regular price, it was GREAT. I will definitely be purchasing more of this. What would you do to insure your family had clean water to drink? Could you imagine living in an area where clean drinking water was not available? Would you help those without access to clean water...if you could? You can. charity: water is a non-profit organization, founded by New York Socialite Scott Harrison in 2006, which focuses on bringing safe, clean drinking water to people in developing nations. All public donations go 100% to fund water projects. $20 can provide one person with clean water for 20 years. $5000 can provide clean water for a community of 500. Charity: water proves every well built with GPS coordinates plotted in Google Earth. See first hand where wells have already been built and the millions that have been helped. Currently, 1.1 billion people are living without access to clean water on our planet which equates to 1 out of every 6. Out of the 42,000 deaths that occur each week from the lack of safe water and basic sanitation, 90% are children under the age of 5. Won't you do something to help? Whether it's sending $20 or getting involved with a fundraiser, surely there is something we can all do to provide this basic yet essential need to those without. 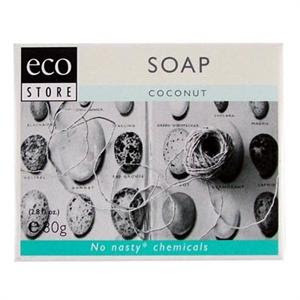 Ecostore creates chemical free products at reasonable prices. From bath to cleaning to pet care, their products are top of the line and and made with "no nasty chemicals", making them better for your family and our planet. Ecostore was developed over 15 years ago by Melanie and Malcolm Rands, and run from their home in an eco village in New Zealand. While their original customer base was fellow "greenies" the word soon got out about the health benefits of the ecostore products, children's allergies and eczema clearing up as well as reduction in respiratory and other chronic conditions. The popularity of "green" and "chemical free" products has gotten them out of their basement and across the world. We now have ecostore USA, which features over 100 environmentally safe products, some which are now available at Meijer stores across the mid-west. We were lucky to be sent some products to test in our home and are very pleased with what we received. •Cow's Milk (0.2% = 220gm to 100kgms of soap) Level is chosen to ensure those sensitive to cow's milk are not affected. This soap was perfectly scented, lathers really well and leaves the skin feeling clean without drying. I've been an Ivory girl since I was a kid and this ecostore soap has given me other alternatives. I've had problems with my face breaking out since my first pregnancy and have tried everything to minimize and reduce breakouts. In two weeks of using this soap on my face (as well as the rest of me) I have seen a drastic improvement. I would recommend it to anyone. Ylang Ylang Essential Oil, Citric Acid. We recently washed the dog (Ashley) with this shampoo. Ashley is NOT a fan of water so bath time is tricky, fortunately she's only 14 pounds and easy to keep in the tub. She wasn't thrilled with the pre-scrub wet down, but as soon as we started massaging the minty/citrus smelling shampoo into her fur, she relaxed and enjoyed the experience. I think she was a little upset when we stopped. A great value and another perfectly scented product. ecostore USA is giving one lucky reader a $25 dollar gift certificate to sample some products for yourself. I've decided to give you LOTS of ways to enter, as this is a store I think everyone should try. *Follow ecostore USA on Twitter (1 entry) leave a comment. *Follow me on Twitter or let me know that you already are (Hunterzmom) (1 entry) leave a comment. *Blog about this contest (5 entries) leave a comment with a link to the post. *Tweet about this contest @hunterzmom (1 entry per tweet) leave a comment for each tweet. Make sure to include e-mail address so I can contact you if you are the winner! This whole job thing had me a little perplexed until yesterday. Not the job exactly, just what I thought I'd be getting out of it. I thought I'd get some quiet time away from the kids, a chance to socialize with other adults, a chance to use my brain and learn new things...and I got all that. I also thought that being active and on my feet for 12-15 hours a week would cause me to lose a couple pounds...so NOT the case. I've actually gained five pounds since I started working. I was trying to figure it out yesterday...all day. 15 hours a week that I'm not munching on something, 15 hours a week on my feet, moving around, nothing strenuous but actively moving about. I'm not eating after work on Wednesdays when I get home around 9, so I don't go to bed on a full stomach...What is it? I racked my brain and couldn't come up with it...until I was driving to work. I don't need a weight loss supplement, I need to stop stopping at 7-11 before each shift to get a cappuccino or large Iced Coffee!!! Facebook is Killing me. Other than the amount of time I spend socializing with all my friends, and the fact that I have really enjoyed re-connecting with old friends from my early school days, I'm very competitive by nature, so when I see a friend post a high score for a game, I immediately check out the game, and if I like it, try like heck to beat their high score. Childish, I know, it's just how I work. But that is not my big FB problem. It's A problem, but not the one I want to talk about here. I'm talking about all the vacation pics all my friends are posting and wishing we had a vacation of our own planned. We keep talking about taking one. Florida has come up, taking the kids to see the Grandparents in Michigan (which is a trip Hubster hates to do due to it being 13 hours in the car each way)has been discussed, but while we are discussing...everyone else is GOING! 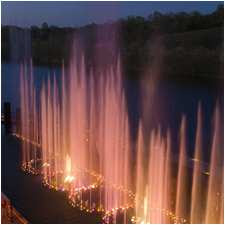 A visit to the Hilton Promenade at Branson Landing in Missouri would satisfy all these wants. It would be someplace none of us has ever been. That's exciting in itself. With lakes, the theatre district, shopping and great restaurants close by, it would provide a well needed break for all of us. Located withing walking distance of the Hilton Branson Convention Center Hotel, I could actually post pics like the one above for all my friends to enjoy and maybe make them wish they were with me. The hotel has every amenity imaginable and spending time as a family, lounging by the pool, would be a part of each day. Whether to wake up in the morning, or to relax before bed...we'd be there. The Hotel is beautiful and a stones throw from the new Payne Stewart Golf Course (my selling point to Hubster). This trip will be added to my wish list. Unfortunately, we've had 3 "family" deaths in the last month and Hubster's vacation time is quickly dwindling due to travel and time off for the funerals. A girl still has to dream though...right? I was in the mood for some chocolaty goodness the other night and decided to make some bark with Boogie. Here is a super simple recipe that only takes minutes from start to eating. Its fun for the kids and a great treat to snack on...if you like chocolate. We started with a package of quick-melt chocolate that we bought at the grocery store and decided we would add raisins and pretzels. You can use anything you like dipped in chocolate, sometimes we also add peanuts and marshmallows but we didn't have those handy. Melt the chocolate. We used the microwave and cooked in 1 minute increments for the first two minutes and then did two times at 30 seconds, stirring in between to melt evenly and avoid burning. We then added pretzel stix (any pretzels will do) you can break them up first for smaller pieces, but we found that the stix break up pretty easy while stirring so we just poured them in. Then we added a healthy portion of raisins. Craisins are really good too. When all add-ins are completely coated and you have a good mix of add-ins to chocolate, spread out on a sheet tray. The thinner the better as it's easier to eat that way. Pop in the freezer or fridge and let it set. We put ours in the freezer for 5 minutes. Take out and break into random sized pieces and enjoy. We put ours into storage containers and keep in the fridge. It's just as fun to make as it is to eat...almost! Leave it to me to let Summer Fun, Birthday Parties, a job, Facebook and every other social network to get in the way of blogging. I should have a LOT to talk about...but sadly...I don't. Oh wait, yes I do. I'm working part time (about 15 hours per week) at West Marine. They are a full retailer of pretty much "all things water". I have no experience in this field, am the only one there who doesn't own a boat, and love every minute of it. While it does cut into my wine time (I work Wednesday nights while the kids are at church for choir practice and this was always my time for wine and virtual socializing), it is a nice break from the craziness that is my life. No matter how busy it gets, no one is ever fighting and I don't have to be the "one in charge"...of anything. I also just found out that they have an affiliate program. I'm checking to see if I can get into that or if it's a conflict of interest since I'm employed by them. If you are into boating or fishing be on the lookout for those links (if I get in). 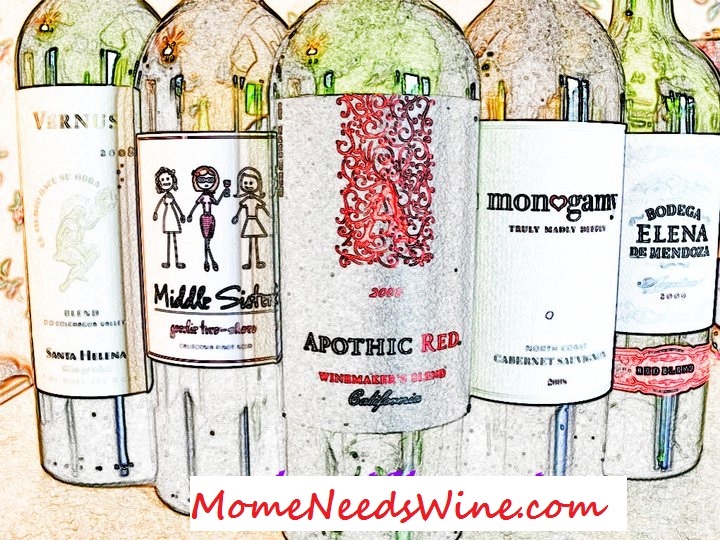 Still on the hunt for great wine under $5. I actually picked up a bottle at the gas station (big gasps, I'm sure) yesterday on my way home from work. I stopped in for a cold drink and a cooler of wine caught my eye. being the label buyer that I am, I saw a unique bottle and without even knowing the price, purchased it. $5.25 at the gas station is the equivalent of $3 at the grocery store or wine retailer, right? It was in the cooler, and a little too chilled, but that didn't stop me, first taste was pretty bland, but I'll try again tonight at room temp and see how it fairs. Be on the lookout for that. ~UPDATE The experiment didn't happen. I was ready with wine, glass and straw but everyone else chose to consume soft drinks and tea. I don't mind drinking alone, I just prefer not to do it with 12 other people. I also didn't think I'd get a good guage on what people thought of the straw. I'll be on the lookout for another opportunity. Good for the Environment AND Your Teeth. I wish I could remember what I was watching, maybe an episode of Wife Swap? I just have a vision of a man and woman sitting down for their morning coffee...and sipping it through a STRAW. I thought this was a little odd. First, they must have let it cool considerably because a hot beverage shot to the back of the throat would really sting. Second,...why would they do this? The woman's reasoning was that it was to protect their teeth, which makes a lot of sense. There are a ton of teeth whitening products on the market and any one of them will tell you that coffee is one of the leading causes of stains on teeth. Hmmm, am I missing out? I'm not a straw person. If I'm having the occasional fast food lunch with a drink, I will use a straw, but only because the cups are not all that stable and I would never consider taking the top off. If I'm at home or at a restaurant that serves regular glasses (or plastic), I drink from the glass even when straws are provided (which I know some people would NEVER do because they do not feel comfortable that the glasses are properly sanitized). Hubster and the kiddos always prefer straws, even at home. So with all the straws that get used daily, at my house and at every where else in this country, how much plastic are we throwing away daily? Think about it. how many straws do you think the average fast food restaurant goes through daily? I worked at several "casual dining" restaurants and can tell you that we went through boxes of straws on a daily basis. That's a lot of plastic getting tossed into our landfills. 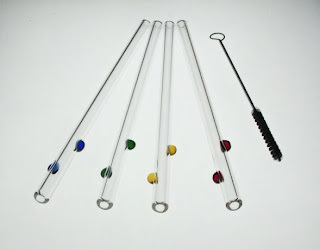 Created by glassblower, David Leonhardt, Glass Dharma has a large variety of sustainable, reusable, elegant (if you want them to be) glass straws. I was a little skeptical when they sent me a selection. I looked at the different sizes and thought "Will I ever really use these?" Before I could get them out of the boxes I was surrounded by four (mine and two neighbors) very excited and very eager kids who just had to try them out. The excitement and fun they had using these glass straws was enough to sell me on them. I also felt confident that they were safe and were not going to break. They are both microwave and dishwasher safe. They also come with a lifetime warranty and if one does break it will be replaced at no cost. I have yet to use one, but being an avid wine enthusiast, have heard about drinking wine through a straw to prevent "purple teeth" while drinking. I'm going to embark on a social experiment. I have been invited, by a friend, to join a Bunko game this evening and (other than my friend) will know no one at the party. I'm taking some wine, my stemless glass (a straw would look funny in a stemmed glass, right?) and my very pretty straw that looks like the ones above. I will tell my friend (and no one else, at least in the beginning) about my experiment and together we will see how well these glass straws are received. Find out tomorrow If I make new friends, or get laughed at for such a silly idea. I think we might all get surprised. This is what I want in my back yard. Attach some lights, add a nice table, chairs and an outdoor sofa and I'll have my own little outdoor paradise. 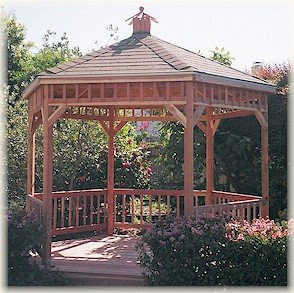 I've been looking at different gazebos online. I know when I mention it to Hubster I'll get the usual response..."Dad and I can make one of those." Yes, indeed they could, but they are never on the same page on when to start and I don't want to wait 5 years. I was also thinking about using some of my synthetic wine corks and covering the roof. Wouldn't that look neat? I figure the synthetic ones would be water proof and would add a unique, 0ne-of-a-kind touch to my back yard oasis. It would also be a small enough project that I would be sure to finish and a good reason to continue to stock up on wine as I'm sure I'm a few 1000 corks short. Anyone want to send me some corks? Keep the good ones, I only need the plastic/rubber ones. Anyone? I've mentioned before that the BEST thing about blogging is the relationships you create with others. I don't know if it's the ability to speak your mind, uninterrupted, that gets others to listen or just being able to get a glimpse into someone else's life or passions that has us always coming back for more. 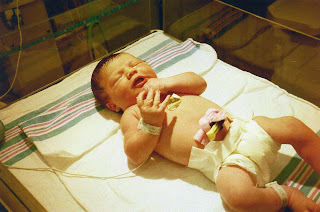 There are blogs that I have visited since day one and other new ones that I find, and can relate to, daily. It's the first group that inspires me to be a better writer and always be on the search for new and interesting material. I recently opened dialogue with one of those writers that have inspired me. I've visited her since I began blogging and have been in awe of her writing, her ability to explain every detail, and her "tell it like it is" approach. She doesn't hold back. She makes her opinions clear and reads right through the bull in any story (or comment). She brings us stories on a variety of topics and keeps us coming back for more. 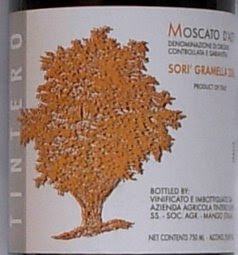 I Love Sparkling Wines - I prefer Muscat Varieties and absolutely fell in love with Moscato D'Asti. you can see it on the top shelf near the right end. Recently I celebrated my birthday and since I love to celebrate, I decided to do a week of wine tasting. that's not unusual for me, but all of the same variety from different vintages, well now that was the trick. Should be vintage 2002 - 2008.
now that sounds simple right ? as well as exploring bottles and vinters you've never tried before. now the task takes on some proportions. also Trader Joes. both have adequate wine selections and several Moscato D'Asti's. who woulda thought it. next we pick one bottle eachtime we hit the store, to add to the tasting pool. we decide to cap it at 4 bottles. yes there is a bottle still left in the fridge which we will be opening later for the final tasting - so it's not included in this review of The first three. if you'll be a lil patient we'll be adding it to the list later. This is an absolutely delicious wine. Fruity, but not syrupy. crisp and bubbly. I enjoyed it late in the evening in a large chilled glass. it helped me get alot of ec dropping done : ) with a smile left over. the notes of strawberry and rich but tart grape were memorable enough, to prompt me to return back to the store in search of another bottle.. alas it was all sold out.. This is not an easy wine to locate - so when I saw it, there was pure joy. Again we found this wine at Western Market in Ferndale, MI. - they have a great supplier. When I saw it, my heart went pitter patter as my hands carefully removed it from the highest shelf, and gently placed it into my basket for it's trip to the fridge at my house. I know about this particular wine from my friend Frank who owns Marios; around the corner from my house in the D. it's on their specials list, and they sell it for $24.99 a bottle, in the dining room. Yeah.. I can tell you, this is a perfect wine for Sipping and as well a great Dessert choice. It went down like silk and honey. the bubbles caressing my tongue were like a decadent pleasure that one should only share with the most delicious of wines... or men. "OOOOOOOO...." at $12.99 it was a bargain on sale. if I find it again, believe Me, this one will be added to my rack. and finally for day three of my Birthday tasting I guzzled a bottle of Deliciousness,, well almost the whole bottle. . This is sooooooooooooo Delicious. it's sinful in your mouth.. This Fabulous sparkling wine tastes of Melon, Honey and Flowers. the grapes were lightly pressed to preserve the lightness and sweetness. the color is Rich and Golden; like honey. at $12.99 a bottle it was a real bargain. I can enjoy this vintage as often as I like; since it's easily located on the shelf at my local Trader Joes. I was so happy to find it and to know that I can get a delicious bottle of Moscato D'Asti without breaking the $20.00 barrier. Last week was crazy. I feel as though I ran around and did nothing. Ever have one of those weeks? Tuesday, Hubster and I celebrated 10 years of marriage. We celebrated at home... sick (both of us) and with two stuffy, coughing kids. It was actually nice to all be sick together (not really) as we all had the same lack of energy. I then tucked it into a box and shipped it to my parents who, I believe, are going to LOVE it. Thursday, the kids and I had a lunch playdate and then played at home all day. The summer is just going by way to fast. Friday, got a call that Hubster's uncle lost his long battle with cancer and is resting peacefully now. Arrangements have been made for tomorrow in North Carolina. Saturday, I worked in the morning (at the job no one has figured out, I'm going to make it really easy for you here in the very near future.) and then took the family out for the Relay for Life (redo) Walk. The vision of all the survivors brought tears to my eyes. What brave individuals. Sunday...the day of rest, I worked from 9 to 5:30 then came home, made dinner, and enjoyed some quiet, snugly time on the couch with the family. Big Daddy Richard has updated his top EC droppers. He defines his top droppers as those who return drops, have easy to find wigets, have a decent load rate and like to drop as he does. If you are not already on this list you stop on over a Traders' Hub and get on the wait list. It is currently at 300 but updated regularly with non droppers and those who have left EC removed. It's easy to just drop from this list as I know I will always find a wiget on the other end. For more information on how this can benefit you and to get on the list go to Traders' Hub. In my infinite search for great wine under $5, I've recently become aware of and a fan of Marcus James. My local store must have been depleting their inventory of the Marcus James Merlot because, up until 3 weeks ago, a 1.5 litre (equal to 2 bottles) was selling for under $7. I think I may have bought them all. 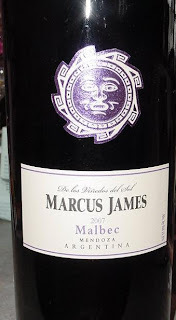 Yesterday I noticed a new label and and was excited to be able to try the Marcus James Malbec. Priced at just under $10 for the BIG bottle, it is definitely a great buy. On immediate opening of the bottle the original aroma was grape juice and I was a little leery. I let it breathe for a few and on second sniff (yes, I am actually sniffing wine now) I caught an aroma of berry, cherry and pepper . A very different aroma from the first sniff. It's flavor is a little lighter than other Malbecs I've tasted but enjoyable nonetheless. It was light and inviting and went very well with the spaghetti and french bread we had for dinner. The subtle spiciness complimented rather than overpowered the sauce, loaded with garlic and crushed red pepper. It also gained strength as it sat. This bottle will last for the next couple days and I am eager to see how the taste changes over the course of it's short life on my counter. I'll update after the last glass. We've been getting ready for the last couple days. The kids and I made cupcakes and a cake decorated with red, white and blue frosting and Sweethearts(TM) Red, White And You candy Hearts. For the season, Sweethearts(TM) are extending their "language of love" conversation hearts to both honor the military and celebrate America's patriotism. The hearts are red,white and blue and have sayings such as "Proud of U", "Home Safe", "Miss You" and "Thank You". The USO is including these sweethearts in care packages to soldiers serving in the U.S as well as overseas. The packages are also available in stores nationwide and are perfect for July 4th, Labor Day, Memorial Day and Veteran's Day Celebrations. The kids had a great time decorating with them and I must say that I was really digging the flavor of the new blue ones. Yum. Here's some pics of our creations.